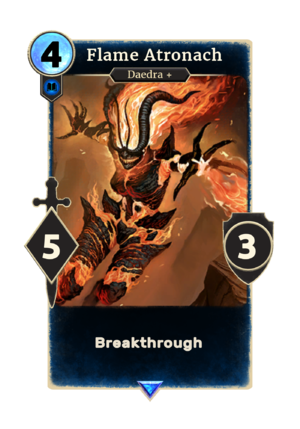 Flame Atronach is a rare Intelligence creature card. The card cannot be obtained as part of your collection, but it can be summoned by other cards, including High Rock Summoner, Expert Atromancer, Supreme Atromancer, and Mages Guild Retreat. It can also appear in NPC decks in the story mode.